German Blown Glass Baby Jesus Diorama Scene Christmas Ornament A beautiful and rare late 1930s German large blown glass diorama scene Christmas ornament with a tiny hard plastic figure of the infant Christ Child inside. The mercury silvered ornament is 3 inches diameter with a deep concave recess or indent. The rim opening is framed with an applied white mica glittered paper border with jagged ice-frost edges. The baby Jesus figure inside has a gold paper scrap halo and is surrounded by a ring of crimped gold wire over a hand painted yellow sunburst. The reflective concave back gives the scene a mirrored effect. The ornament has a non-standard antique wire hanger attached to the pike, extending to the edge of the scene. The glass concave ball is in wonderful condition with no damage and very little wear to the paint or silvering. 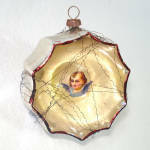 German Mercury Glass Angel Bubble Indent Christmas Ornament This unusual and rare 1930s or earlier German blown mercury glass indented Christmas ornament has a pale yellow blown glass bubble in the center, onto which is attached a little paper scrap angel or cherub face. The matte yellow coloring of the bubble or ball is softly reflected onto the silver back wall of the ornament. It measures 2-3/8 inches diameter and wrapped in curly bullion wire. The ornament has double pikes, one for the metal cap and one at the paneled center back used to create the inner bubble. There's a spot of mercury loss to the left of the bubble, otherwise the silvering is shiny and in good condition considering the age of the ornament. The wires have shifted some over the years, and the dark red paint along the rim outline has some wear. Scrap Angel Glass Diorama Christmas Ornament in Tinsel Star This fancy indented diorama style blue glass Christmas ornament has a scrap paper angel or cherub in the center surrounded by a puff of pale pink cotton. The ornament is encircled by a wired tinsel star and is wrapped in crinkly gold bullion wire. It was made in Western Germany in the late 1940s to early 1950s. Italy Glass Diorama Scene Indent Christmas Ornament Father Christmas I've never seen one of these Italian blown glass diorama style indent scene Christmas ornaments that wasn't silver on the outside, blue on the inside. This one has a rainbow shaded red, green, and yellow gel tint coloring. I think it's an earlier version of the more common 1950s Italy diorama ornaments. Glass Indent Diorama Christmas Ornament Scrap Angel Inside This 2-1/2 inch diameter mold blown silver mercury glass Christmas ornament has an indented center with a paper scrap angel inside. The angel holds a wreath and is framed in a puff of cotton. The opening is scalloped due to the embossed ribbing at the sides and back. The metal cap is marked Germany. There is some degradation of the inner silvering which caused a cloudy effect, mostly to the back. The scrap angel has some damage (missing her feet) but it's not noticeable until you inspect it closely. This shape and style of diorama scene ornament was made in Italy in the 1950s, usually with thicker necks and heavier glass. This is not the first older German ornament like this I've seen. I believe the Italians copied the older Germany ornaments. 1950s Composition Santa Inside Glass Dome Christmas Ornament A rare diorama scene type Christmas ornament from 1950s West Germany. It's a 4-1/2 inch high transparent glass teardrop with a little ceramic or clay composition Santa Claus figure standing inside. The lower third of the glass is painted with trees, grass, and a fence. The inside of the glass has a smattering of tiny white specks. Since there is no glitter on the ornament, the little specks are probably meant to represent snow. The ornament is in excellent vintage condition with no damage. The Santa figure has some age crazing. Italy Belsnickle Santa Large Diorama Indent Glass Christmas Ornament This large 1950s Italian blown silvered glass indented diorama style scene Christmas ornament is a fat teardrop shape with white mica glitter snow frosting on the outside, scalloped halfway down the back. Inside the deeply recessed indented opening is a painted plastic scene of a Belsnickle or Father Christmas style Santa, carrying a staff or walking stick with his toy sack slung over his shoulder. The inside of the ornament is tinted pale yellow and is very reflective, and there's a little cloud of real cotton behind the figure. The ornament is nearly 4-1/2 inches long from the top of the pike to the tip of the pontil point by more than 3" wide at the center. The metal cap is marked Made Italy. The ornament is in excellent condition, virtually mint. A scarce and desirable diorama style Christmas ornament. Italy Sugar Bells Large Diorama Indent Scene Glass Christmas Ornament This large 1950s Italian blown glass indented diorama style scene Christmas ornament is a fat teardrop shape with white mica glitter snow frosting on the outside, scalloped more than halfway down the back. Inside the deeply recessed indented opening are a pair of white mica encrusted plastic sugar bells in a green bottle brush wreath against a gold background. The ornament is 4 inches long by just over 3" wide at the center. It's in excellent condition with no damage or silvering loss. There is light wear to the mica glitter. The metal cap is marked Made Italy. Belsnickle Santa Glass Diorama Indent Scene Christmas Ornament This 1950s Japan Christmas ornament is a 2 inch blue blown silvered glass diorama scene indent. Inside the deeply recessed center is a painted hard plastic Belsnickle style Santa figure with a walking stick or staff and toy bag slung over his shoulder. A sprig of which bottle brush is below Santa's feet and the white mica glitter snow is in the background. The ornament measures about 2 inches diameter and is in very good vintage condition with no chips or breaks. Italy Fawn Deer Diorama Scene Indent Glass Christmas Ornament This is a 1950s Italian diorama style indented dimensional scene Christmas ornament. Inside the concave recess in the silvered blown glass is a hard plastic fawn or baby deer figure standing amid pine trees and mushrooms. The ornament is silver on the outside, cobalt blue on the back wall with white mica snow frost. About 2-1/2 inches diameter, in very good vintage condition with no damage. Italy Madonna Child Nativity Diorama Indent Christmas Ornament This is a 1950s Italian diorama style indented dimensional scene Christmas ornament. Inside the concave recess in the center is a thin hard plastic Nativity scene of Mary and Baby Jesus. The back wall of the indent is tinted cobalt blue with two white decal stars above the scene. The ornament is ribbed on the outside with a silver back and is about 2-3/8" diameter. There's a little silvering loss near the pike, otherwise excellent vintage condition. Angel Dimensional Dome Scene Glass Christmas Ornament This unusual 1950s glass diorama type dome scene Christmas ornament is from West Germany. Inside the clear glass dome is a painted hard plastic curly haired angel holding a lantern. The bottom of her gown is wrapped in a cloud of pink spun glass angel hair. Arches in white mica glitter outline the front and back of the glass ornament, the sides are decorated with mica glitter snowflakes. Skiing Angel Dimensional Dome Scene Glass Christmas Ornament This dimensional glass dome scene Christmas ornament was made in West Germany in the 1980s. Inside the clear glass ball is a painted hard plastic angel in blue snowsuit on orange skis. The glass is wrapped in gold crinkle wire and has a coil of wired silver foil braid at the top. The back of the angel is marked Germany, and the underside has a paper Made in West Germany label. In excellent condition. Angel Paper Scrap Scene Inside Glass Egg Christmas Ornament This unusual and charming vintage Christmas ornament from 1950s West Germany is a blown glass teardrop or egg-shape mica-frosted dome with an embossed litho paper scrap scene showing through the transparent arched "window" at the center. The curly haired barefoot angel sits atop a cloud and holds a star.